Having flat feet can be frustrating at the best of times but truly painful at the worst. This is especially the case when wearing dress shoes as they tend not to offer the necessary comfort and support. Flat feet and low arches tend to also cause overpronation, which can cause other complications. See anything you like? Use the links above to jump ahead or scroll down to read about them all. Furthermore, we’ll also talk a bit about flat feet and the specific requirements required to cater to them. Short on time and want to dive right in? Use the Quick Buy Guide below to jump straight to the retailers. 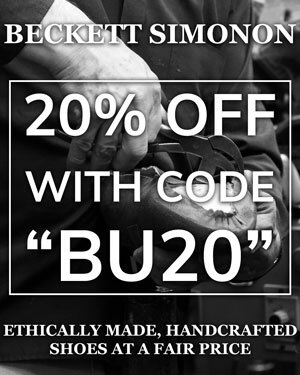 Otherwise, scroll down to learn more about each of the shoes. 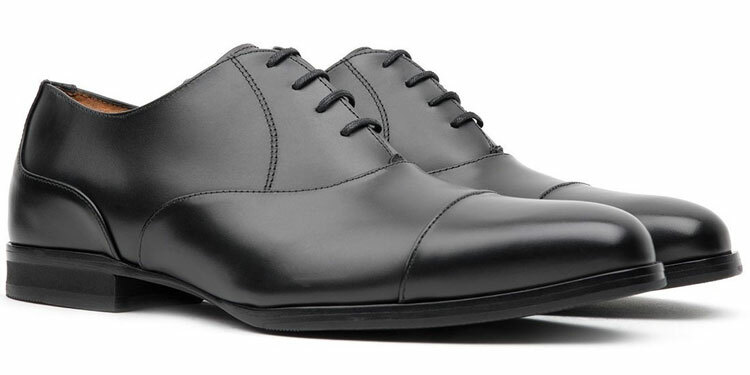 What Are The Best Men’s Dress Shoes For Flat Feet? 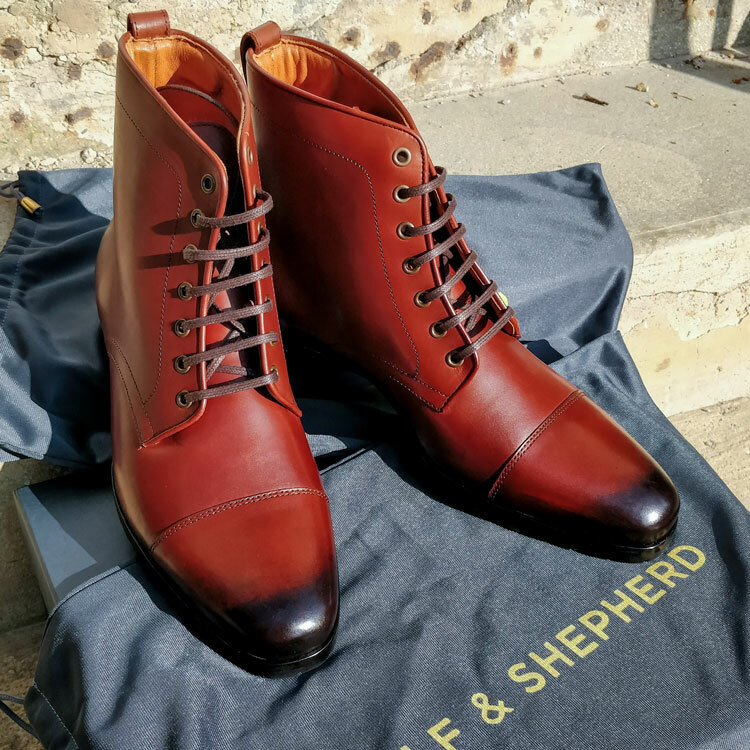 Designed featuring patented technology inspired by athletic shoes, Wolf & Shepherd have create formal footwear that’s ideal for low arches. Supportive midoles reduce pronation whilst the EVA foam heel reduces stress on the plantar. Meanwhile, the memory foam footbed cups the contours of your feet. With the timeless design of an Oxford shoe, the Closers are perfect for almost any formal gathering as well as the workplace. They’ll stand out with business professional attire whilst blending right in with black tie. Although there are also honey and maple options, which offer different shades or brown, the black oxford shoe is a more practical choice. This is especially the case if you’ll be wearing them professionally with a suit. 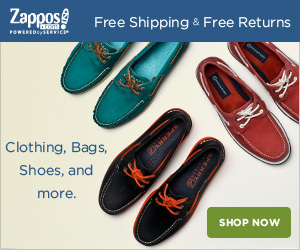 Rockport has designed orthotic shoes for a number of years that are both understated and stylish. This is a far cry from the usual orthopaedic footwear that’s often quite unsightly. Features such as the EVA footbed provide the wearer the necessary stability and support. 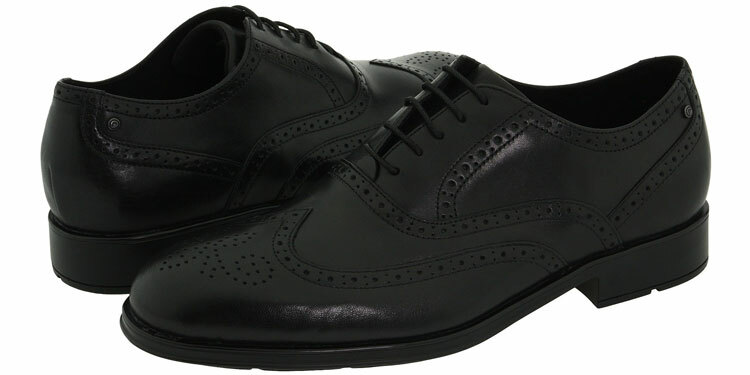 Great for business professional and cocktail attire, these black brogues are stylish and almost indistinguishable from conventional dress shoes. If you need the orthotic aids at work but don’t want to skimp on style, they’re a solid choice. Those looking for traditionally brown brogues should refer to the next entrance in this list as the Almartins only come in black. Nevertheless, it’s still a stylish colour ideal for more formal wear at a very affordable price. 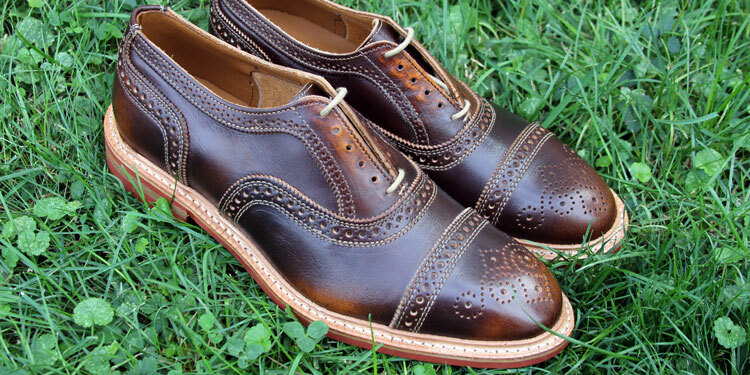 The Strandmok by Allen Edmonds isn’t an orthotic shoe nor one inspired by athletic footwear. However, it’s a traditional dress shoe that features all the hallmarks of high-end construction such as a Goodyear welt and Dainite sole. Extremely comfortable, they’re great even for those with flat feet. One of the most versatile brogues we’ve seen, they’re great with not only casual wardrobes but more formal ones too. Whether you’re wearing jeans, chinos, corduroy or a three-piece tweed suit, they add a flair to your outfit. Unlike the Almartin above, these are only available in brown. Nevertheless, it’s a beautiful brown leather with vintage hues of different shades. Furthermore, the rest red Dainite soles are contrasted by a tan welt for extra style and complexity. While the EVA heel reduces strain with every step, the memory foam ensures all-day comfort and support for your arches. 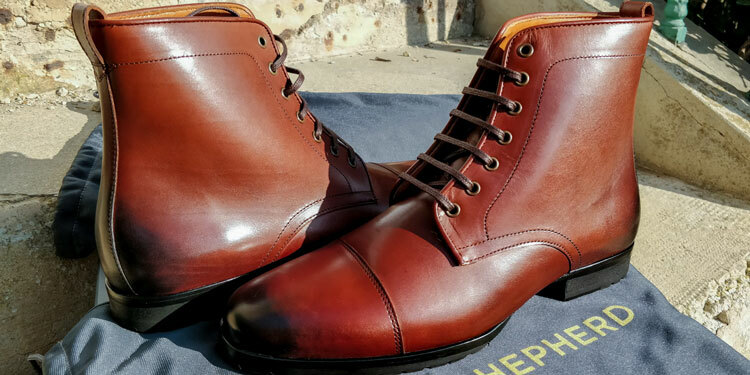 Meanwhile, the lightweight rubber and calfskin build prevents the boots from feeling heavy throughout the day. Ideal for versatile wear in a number of situations, the Breakaway boots can be worn for either business professional or casual occasions. Of course, their dressiness is dictated by the colour you choose as we explain below. While the reddish Cognac is the most versatile, the black Onyx calfskin leather is great for business professional wear while the honey tan is ideal for casual occasions. If you’re really suffering from flat feet and overpronation, Ecco’s shoes feature their branded Comfort Fibre System as well as a leather-covered inlay sole. These offer protection and support for low arches. 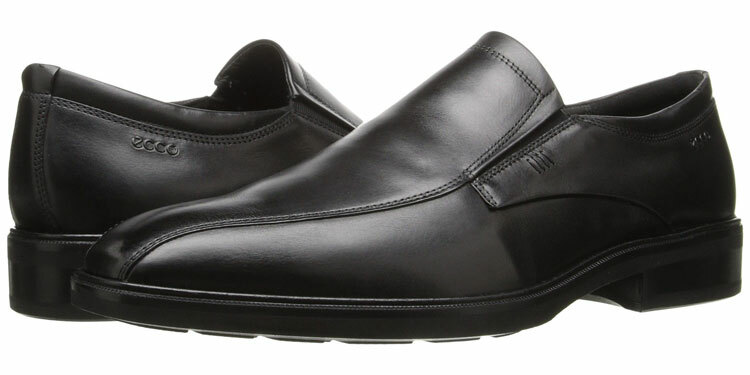 A great utilitarian shoe for men who lead professions when they’re on their feet all day, the Illinois is a discreet and understated Venetian loafer. These look great with black trousers and a white shirt so if you’re in catering, they’re an excellent choice. Whether your profession requires brown or black shoes, you’ll have both to choose from. We find that the brown loafers are more casual so if your job has a strict dress code, opt for the black ones. As mentioned above, they’re versatile and easy to wear. You could pair these with more casual attire but you could happily wear them with a more relaxed and laid-back suit. 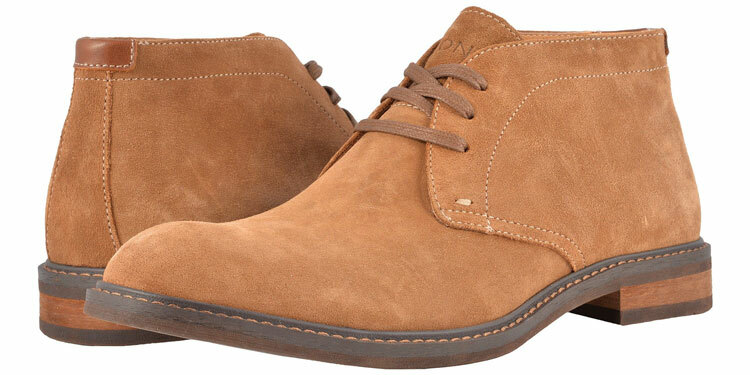 Offering all-year performance, they’re a great casual boot for winter and something to pair with a suit during summer. Both the tan and black options are made from water-resistant suede. We have a preference for the tan shade as it’s going to be more compatible with the majority of wardrobes. People with flat feet will often cringe at the thought of wearing dress shoes for prolonged periods of time. The habit can be quite uncomfortable and even painful on a daily basis. Fallen foot arches or flat feet is a particularly common trait that may affect up to a third of adults. The foot arches have their own distinctive shape thanks to the ligaments and tendons between the metatarsal and tarsal bones. In short, they act as nature’s shock absorbers and have evolved to specifically allow a person to stand upright and walk on two feet. The majority of people with have neutral arches but there are others that have high or low arches, which vary from the norm. Although they may never experience any discomfort, there is always a risk. This is because feet may pronate according to their type of arche, which is the way they land on the ground when walking. For instance, flat feet experience what is known as ovepronation, which means that the feet roll inwards to compensate as a consequence of the lower arches. Finally, bear in mind that not all fallen arches are genetic or occur naturally. If you’re often standing for prolonged periods on hard surfaces, your foot arches may even collapse. Therefore, it’s worth considering preventative measures if you follow such a lifestyle. Pronation will put strain on the ankles and knees because your feet don’t follow a natural gait, which can cause other disorders such as Plantar Fasciitis. However, you can wear shoes that support the arches and ensure that your feet follow a natural stride when walking. Motion Control: A trait from athletic shoes, motion control is often part of the heel design, which prevent your feet rolling in or outwards. Stability: Athletic shoes will feature rollbars but a well-design midsole will keep your stride straight and prevent pronation. Arch Support: The footbed’s cushion will feature padding that cup the arches and provide just the right amount of support. However, make sure that they don’t provide too much support as this can cause painful bruising. The above shoe design features can have a profound impact on your lifestyle and make flat feet less painful or tiring. Furthermore, the reduced overpronation will prevent ankle, knee or hip issues in the future. Reviewed by Jeff E., on 30th November . "Cosy shoes. I suffered from sore feet after long days due to overpronation and feel much more comfortable."